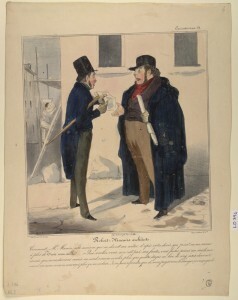 Brandeis University has posted nearly 4,000 digital images from their collection of lithographs created by Honoré Daumier. The collection can be searched by either basic or advanced methods, or it can be browsed by title, subject, or date. The images provided are 800 pixels on the long side, so they will work fine for PowerPoint; just don’t try to stretch horizontal images to fill a slide or they will pixelate. This entry was posted on Friday, May 21st, 2010 at 9:47 am and is filed under Web resources. You can follow any responses to this entry through the RSS 2.0 feed. Responses are currently closed, but you can trackback from your own site.